It is a very nice Ombre blonde hair, which feels soft and full. The Ombre straight weave extension is made with 100% real Brazilian virgin hair. The straight weave is always thick from the root to the end, please brush with a wide-tooth comb, it never shed. The hair could be dyed into any darker color or being curled. Ombre hair is the hottest trend in recent years, do not miss it. At the root of the hair, the color is #1b, while the hair shaft and ends are all in #613, the latest T1b-613 Ombre hair is a new style into our hair collection, the hair perfectly fits for African American women, it will also blend well with the hair of hot European girls. 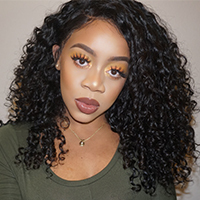 Made with the most natural Brazilian hair, this Ombre 613 hair can be restyled as you desire, like dying and curling, and you do not need to worry, after being restyled, the hair could still keep its soft and silky texture. The hair is beautiful and really soft. The ends are a little dry but oil can fix that instantly. I have not experienced any tangling so far. perfect 613 color Review by Sussie R.
Hair is beautiful, fast shipping only took 3 days. Will tell you more after install.